Long term viewers of Gardening Australia will be, like us saddened to hear of the death of Colin Campbell this week. Colin was a presenter on the show from its outset in 1990. Our condolences to his family and friends. A video memorial to Colin can be seen on the Gardening Australia website. My friends have just moved to a new home which does not have much in the way of a garden, except for lawn, some undistinguished shrubs and a photinia hedge around the back yard (not my favourite plant). On the plus side this does mean that they are not too distressed at changing what is currently there to a new design that will include raised veggie beds, a pergola and a small orchard. 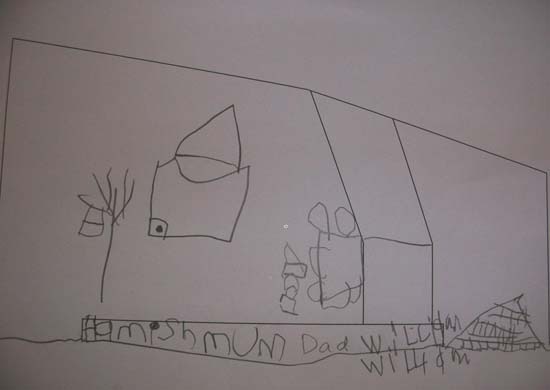 A design concept from the youngest member of the family. Before they moved they did at least have sufficient time to transplant some of their prized asparagus plants to the new garden. The asparagus is already taking advantage of their warm northerly aspect and are pushing their spears up out of the ground. Envy, envy, envy. I don’t expect to see our asparagus for the better part of a month yet. Back at Chez Fork we are also shifting and renewing garden beds. So what’s new? With the Palais des Poules in place we’ve lost several square metres where we used to grow vegs. Next to the chook pen TB has built a mound to grow pumpkins. The aim is to encourage the pumpkins to grow up a trellise (not yet in place) along the western end of the chook pen. Hopefully the chooks will get some shade and the pumpkins will be marginally more constrained than they are most years. 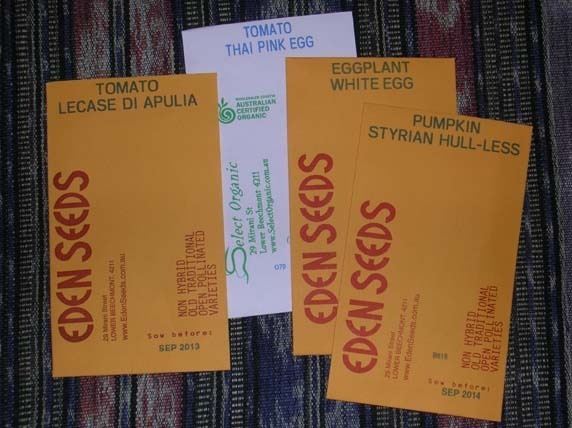 We have just taken a delivery from Eden Seeds including a new pumpkin for us Styrian Hull-less, the latter referring to its ability to grow good pepitas. We also have two varities of tomatoes to try Lecase di Apulia: a plum shaped red fruit to 50mm, Italian drying type, small bush plants. We like having lots of tomatoes for saucing and pulping. The second is Thai Pink Egg: jade-pink egg shaped fruit to 40mm use fresh and in salads, sweet firm flesh, incredibly prolific, resists cracking even in heavy rain areas. After last summer’s drenching rains when we lost almost all of our Black Krims to splitting, a plant that resists cracking seems a good idea. Finding room to grow potatoes is a perennial question for us. A crop large enough to provide a year long supply takse up a lot of space. We’ve considered getting a plot at a community garden solely to grow potatoes. We already have one lot spuds growing in the giant purple pot, from which we got several kilos of spuds earlier this year. 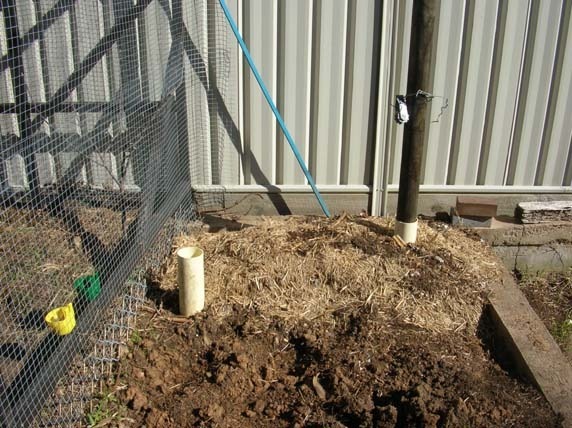 Growing up is definitely the way to go so TB made a cylinder out of large chicken wire, supported by several stakes. He then started layering it with compost, straw and some blood and bone, adding potatoes as he went. I’m told that there are three layers of potatoes in here already. Of course it will all settle down over time so more layers and more spuds will be added in the coming weeks. 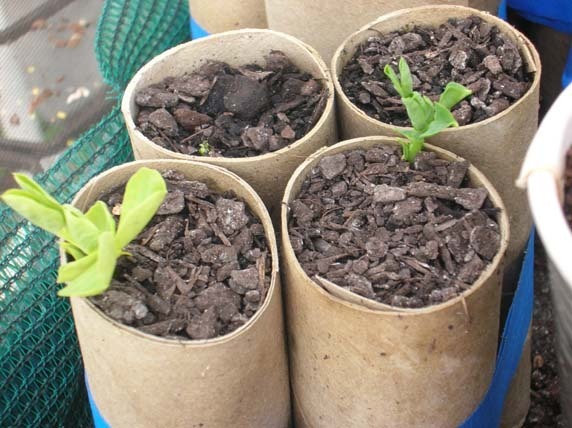 This must be a good idea as they showed how to make one on Gardening Australia last night! We are preparing the garden for spring. The heavy work has fallen to TB as I have injured my knee. TB has been busy transplanting self-sewn lettuces from the front garden to a space in a recently cleared bed at the back of the house. 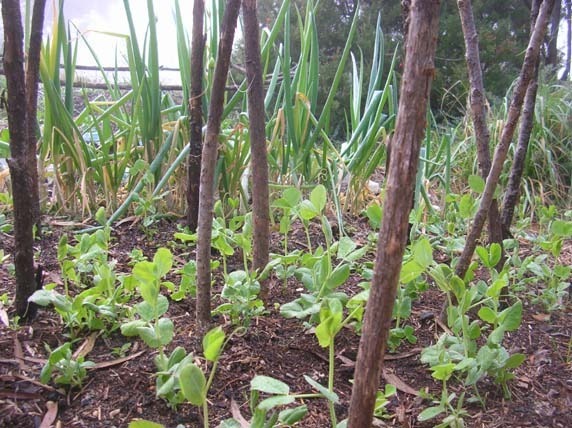 The Purple Podded Peas in the front yard are well out of the ground but will take a few more weeks before they get a real move on. 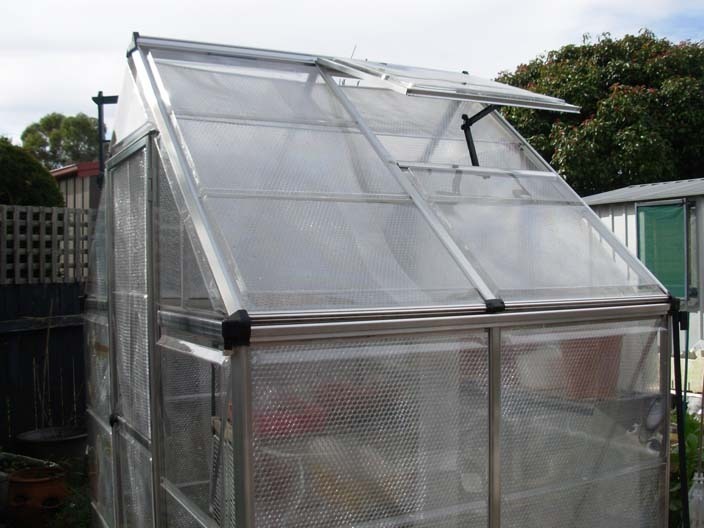 We currently have started 3 lots of peas (Greenfeast) and snowpeas sprouting in the polyhouse. This year we have bought in some new seed potatoes, King Edwards (foreground) and Pink Fir Apples (rear) to improve our yield and hopefully avoid viruses that might be lurking in our previous years spuds. The potatoes have been set out to chit, that is to encourage them to sprout prior to planting. Being left in the light will encourage the plants to shoot. I did see a recent suggestion that you should remove all but one of the strongest shoots to encourage a strong plant. I’ll have to give it a try. Potatoes chitting in the polyhouse. 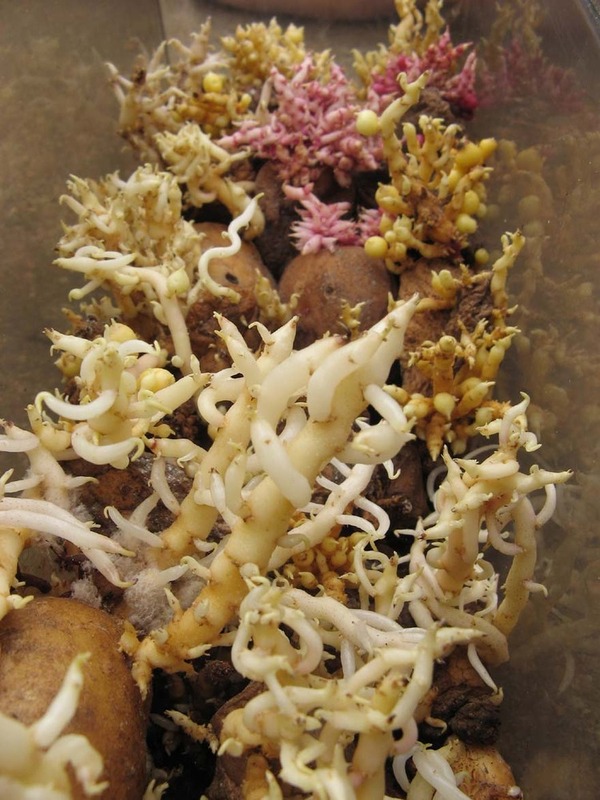 Of course if you forget about your potatoes, as we did with these forgotten in the bottom of the fridge in the shed, you can grow a fair facsimile of a coral reef! According to Peter Edmunds that is the second most regularly asked question he gets asked, after “How did you get into chocolate?” These are not surprising questions when you are the chocolatier behind the Lindsay & Edmunds brand of organic chocolate. Peter spoke at the August talk at the Kitchen Cabinet, ‘The Chocolate Maker ‘ . Chef Janet Jeffs told the assembled crowd that we had to suspend all previous notions of chocolate when we faced the lunch that she was presenting that day. Savoury, not sweet was to be the order of the day. Peter started as a chef at Froggies restaurant in Sydney and then went through a variety of jobs including sailing instructor and yacht skipper, which led to Peter and his wife living in the south of England and northern France for several years. They were impressed by the specialised produce they found in the various farmers markets across France and were also surprised by the quantity of organic food that was available both in the UK and France. I was so busy eating my way through my entree that I managed to miss the critical part of the story where Peter and his wife decided to become producers of organic chocolate. I was distracted by this entree, a savoury chocolate tasting plate. 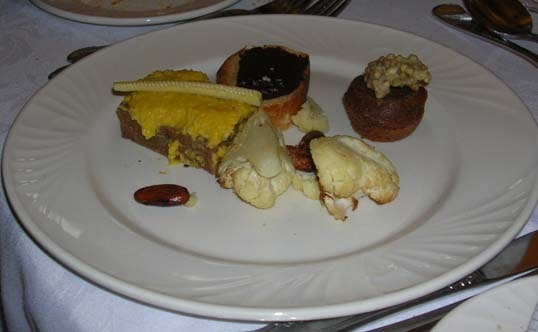 At the back of the plate is bitter chocolate on crostini; front left is the Aztec cornmeal ploenta, to the right the cocoa buckwheat cakes; and in the front roasted cauliflower with cocoa nibs. I really liked the oily, complex cocoa nibs and could understand why Peter said they could become an addictive snack. Thankfully the notes on the back of the menu tell me that on returning to Australia, having committed to eating organic food wherever possible, the Edmund’s realised that there was a distinct lack of quality organic chocolate on offer. The next step was to research this area and then launch thier own brand of Lindsay & Edmunds chocolates in 2008. While initially based in Sydney, Peter and his wife travelled regularly to the Canberra Farmers Market. They subsequently moved to Canberra and now produce their chocolate at Fairbairn. You can actually drop by their facility and get a cup of coffe or choclate while watching the chocolate being made. While Peter and his team always use organic chocolate, they also decided to switch their entire production over to sourcing certified Fairtrade chocolate after learning about the extensive use of child labour in the growing and harvesting of cocoa. Peter is clearly passionate about these decisions and was able to discuss a range of issues around the cocoa growing and marketing system with the lunch participants. 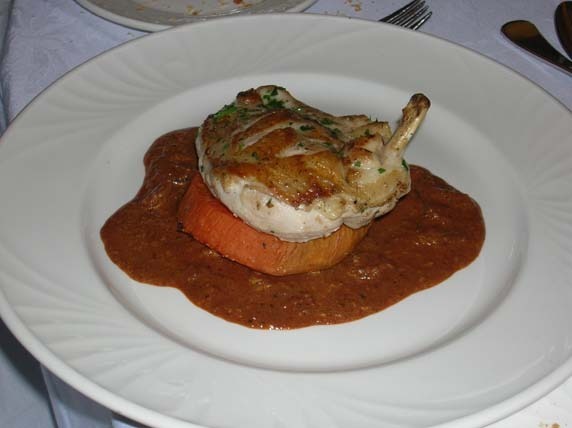 The two key ingredients for the main course of Mole Poblano Oaxaca were cocoa powder (available at Mountain Creek Wholefoods, Griffith) and dried, smoky dried chillies.Chef Jeffs describes this as a traditonal Mexican chocolate, chilli, spice sauce served with baked organic chicken. There are stacks of recipes and lots of interesting back stories to this dish should you want to chase them up on the interweb, but I was just happy to sit down and savour every luscious mouthful. Thanks to the Kitchen Cabinet staff who directed me to Janet’s recipe here. We had all really eaten well by this stage, but there was still dessert to follow. What was described as a tasting plate of Lindsay & Edmunds chocolates could have been more accurately described as a giant slab of chocolates! 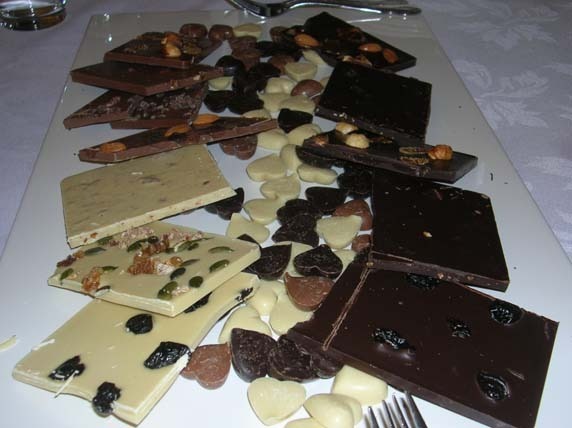 An extremely large tile (twice as wide as my big bathroom tiles) was placed on the table, loaded with slabs of chocolates studded with fruit, nuts and other tasty ingredients along with white, milk and dark chocolate hearts. While I’m normally a complete dark chocolate fiend, I actually spent a lot of time devouring the white chocolate almond praline, (third back on the left hand side); others at our table were smitten by the dark chocolate caramelised chilli and macadamia slab. Not that you had to pick favourites. The eleven people seated at our table were unable to eat it all so what was left went home with everyone in paper napkins. It really was a most generous serving. Last Sunday’s lunch displayed both the versatility and value of high quality chocolate. Our fellow attendees also felt that it was perhaps the best value for money Kitchen Cabinet event we have attended, even counting the truffle lunch. Congratulations to Janet Jeffs and her team. Thanks also to Peter Edmunds for reminding us that the best chocolates should have only 3 to 5 ingredients in them (not counting specific added flavourings such as fruit or nut pieces). Milk chocolate should contain nothing more than cocoa mass, sugar, vanilla, dairy and emulsifier. Dark chocolate should contain cocoa mass, sugar and vanilla. So don’t forget to read the back of the package before you buy. Here’s confirmation that spring is definitely on the way ..YES … the magpie has started attacking the postman again. Poor man, you can here the bird coming as he rides down the street. This fits right in with the description from the Jardwadjali and Djab Wurrung and aboriginal communities of south-western Victoria (Gariwerd-Grampians) that this season is larneuk – the season of nesting birds and changeable weather. In terms of D’harawal seasons (Sydney area) July and August is the season of Golden wattle blooms and Lyrebirds building their dancing mounds, while the days become longer and the cool south westerly blows. More information of indigenous weather knowledge can be found at the Bureau of Meteorology website. 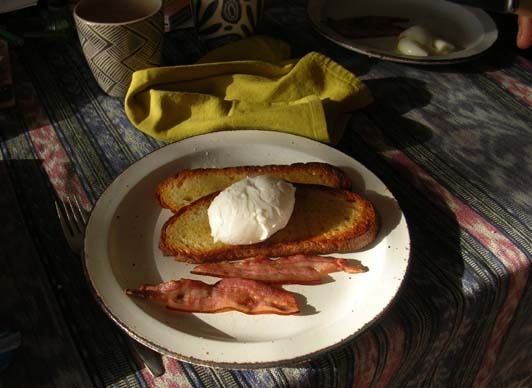 Here is the large egg at breakfast the next day, along with some home-cured bacon and home made bread. What could be a better way to start the day. And for those that asked – it wasn’t a double yolk egg. If our first chook egg back in June was a welcome surprise to us this egg from the next chook to start laying was certainly a surprise (and probably was for the chook herself). It came in at a whopping 92 grams! 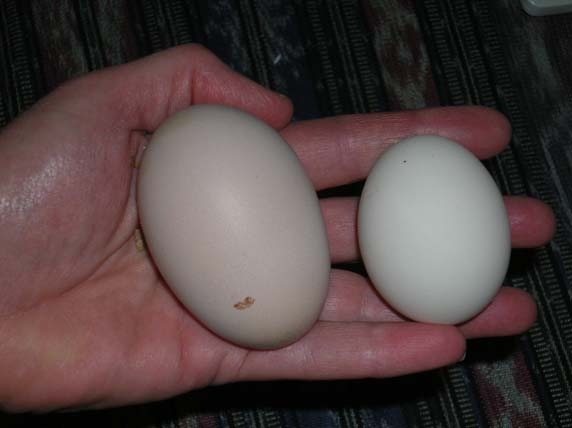 A ‘jumbo’ chicken egg weighs 70gms, so this egg is more like the size of a duck egg. For comparison Arte’s egg to the right of the photo weighed 56 gms. Just to keep us guessing it was laid while we were out so we have no clear idea whether it was laid by our Leghorn, which is our biggest chook, or our Australorp which are meant to lay brown eggs. Anyone prepared to own up? The girls, Arte (speckled), Lettie (white) & Dottie (black) having a grass snack. I have been working on my cheese making since I did my course at the end of June. So far my production has been limited to fetta and ‘Greek style” yoghurt (just read extra creamy there), which are very useful products for our regular cooking. Both the straight brined fetta and the fetta marinated in oil and herbs taste very good. We did make camenbert at the course, but to be truthful, the ones we tasted were pretty much the same as flavour as the camenbert available in the shops. Given the additional fiddle of waiting for the mould to develop and the cheese to mature I decided that unless the milk I use is a cut above the average that I won’t bother with making this cheese. That said, on our latest visit to Newcastle one of my family members told me that Udder Farm, the dairy near their place was selling non-homogenised pure Jersey cow milk. These bovine beauties are renowned for their ability to produce milk with a very high cream content and were, in my childhood, quite a common sight on Australian farms. Indeed my great grandfather had a Jersey herd and my Aunt used to proudly recount that the cream content in the milk from his herd was so rich that they had to cut his cow’s milk with that of other herds to reduce it to the lower cream standard required by the dairy company. My sister obtained the necessary milk for me and I was ready to make some camenbert of, hopefully, really good quality. Did I mention that it takes 4 litres of milk to make 5 cheeses? All up the 5 cheeses I’ve made from this milk weigh in at 825 grams so not your low cost cheese unless you have a dairy herd to hand. I took some photos at the early stage of the process.This is one of the hoops of cheese at the end of the first day. As you can see from the photo below the cheeses shrink over time, losing lots of watery whey in the process. On the upside, our chickens absolutely love the whey as it still contains milk proteins that are very good for them. 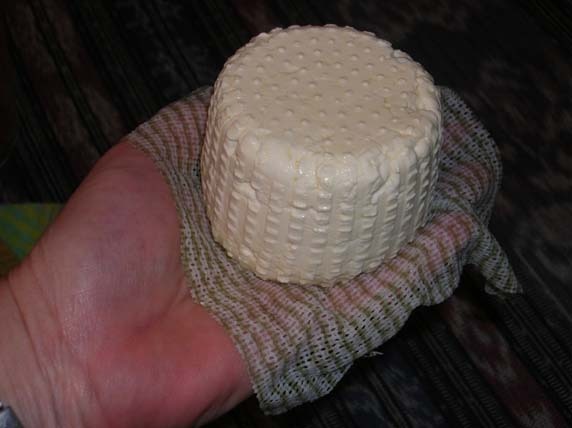 You have to keep an eye out for the white mould developing on the surface of the cheese, before you can mature them. Thankfully all mine are suitably fluffy after 8 days sitting out in the kitchen. 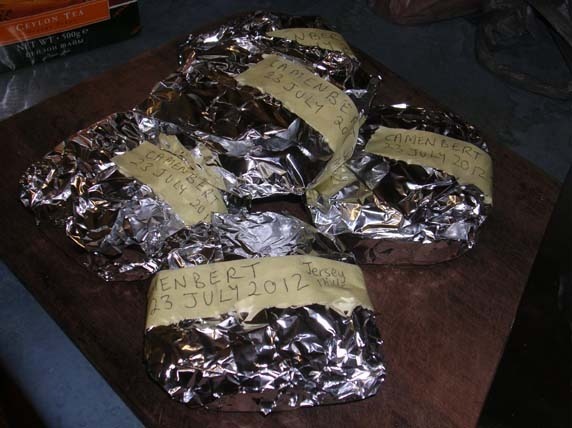 I then wrap them in foil and set them aside to mature for at least a month in the fridge. Here’s one I prepared earlier, indeed this is the first camenbert I made at our class. It’s past the one month mark but still is a bit hard in the centre. Fingers crossed it will be ready to go when the spinners come over for the evening in a few weeks time. 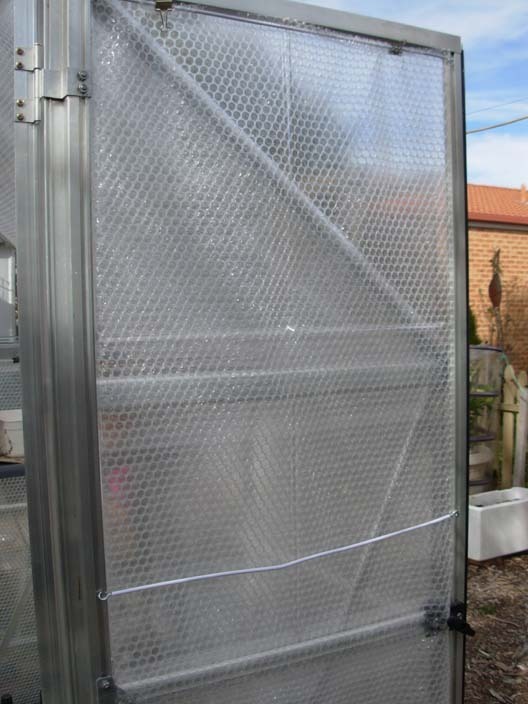 The frosty weather continues and friend M has been working on a homemade insulation solution for her greenhouse – bubblewrap! She got her inspiration from a youtube video (where else these days?) of a similar solution in the UK. She tells me that she used her curtain making experience to swap wires for bamboo to hold the wrap in place (as you can see on the photo of the door (above). I was just glad happy to contribute the serious amount of bubblewrap that came with my new curtains earlier this week. 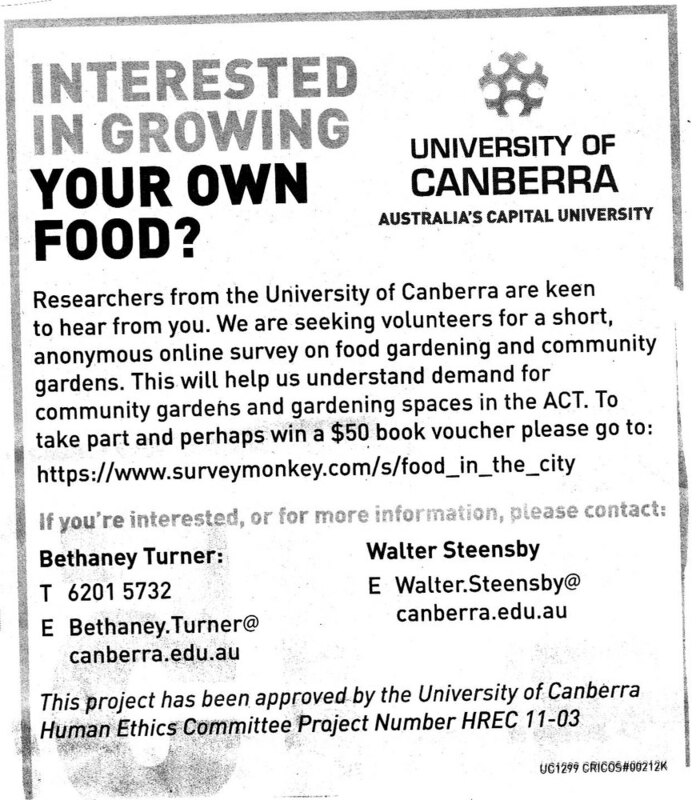 Canberra residents may have seen articles in the local papers about work being undertaken at the University of Canberra about growing your own food.